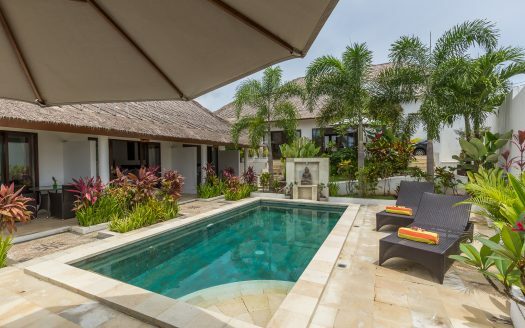 This Stunning Freehold 1100 sqm villa in Pecatu is built over three levels on a 1600 sqm of land. Located in a high end private villa community that is close to many beautiful of the 5 star resorts of the area and the famous west coast beaches of the Bukit. Complete with high end fixtures and finishings, including frameless glass doors through out taking advantage of the amazing sea views, all the way past the airport. High ceilings along with stunning marble floors and bathrooms. On a clear day the volcanoes of north west Bali are visible as is the sunset from the main pool deck. This sensational Villa has 6 bedrooms all with en-suites including a powder room for convenience on the ground floor. The white kitchen is solid wood complete with wine fridge, fridge, dishwasher, oven and a beautiful stainless steel 2 metre cooking hob. All benches and splashbacks are ceaserstone with a feature island along the front with a stunning slab of teak for a counter top. An outstanding suspended infinity swimming pool 27m x 5m runs across the ground level of the Villa with an amazing sunken seating area sheltered with beautiful umbrella trees, to also enjoy the view or swim up to the seating area. A full size gymnasium is located downstairs along with another 2 bedrooms both with en-suites and 2 maid’s bedrooms and a bathroom. This level also has a beautiful stone terrace with lovely sunset and sea views. The luxurious Villa sits at the top of the hill and has breezes all year round. The Villa is A/C throughout along with ceilings fans in all rooms. The Garden has been completed by a landscape Architect .